Hey ya'll! Happy MONDAY! I hope everyone is feeling refreshed and ready to tackle a new week! I sort of like Monday's because it's like a blank slate for me. I break out the planner on Monday morning, sit with a cup of tea (I don't drink coffee!) and the ideas start flowing! It's like a week full of possibility! Last week was pretty busy, Nick was home from school ALL week because of the massive amounts of snow we had EVERYWHERE. I was still able to accomplish some of the projects on my to-do list, which always makes me feel semi-successful. Even if it's the littlest thing. Like switching up the hardware on my cabinets, which I did last week and will be posting about SOON! The change was pretty darn dramatic. 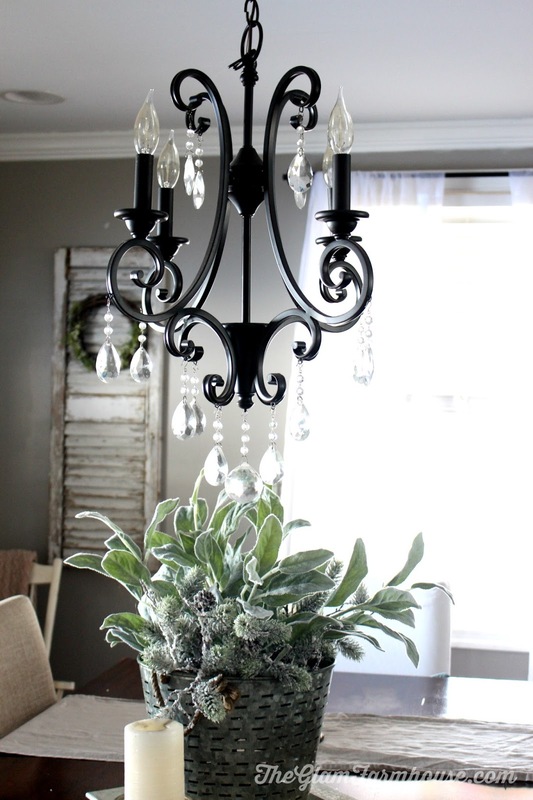 I love little updates that are easy, cheap and make a huge impact on a space. Today though, I'm just sharing one tiny little "change" here at the Scardina house. I get bored a lot, and I admit, I'm feeling sort of bored with winter right now, I will probably start Spring/Easter decorating super early and hope you guys don't hate me for it! For a long time (almost 2 whole months! a record here!) 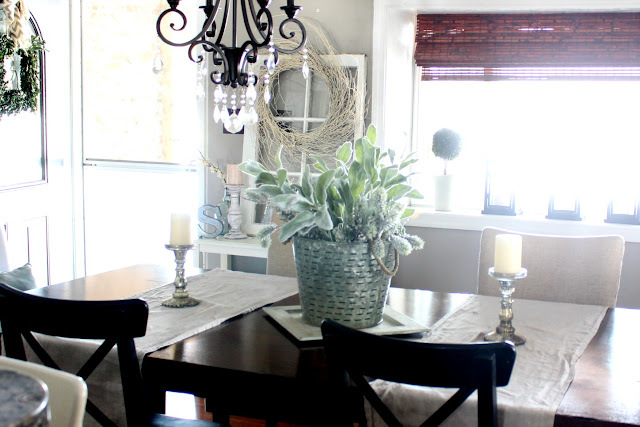 I had this lantern and pretty cotton garland as my centerpiece for the dining room table, it's gorgeous and I love lanterns, but as always..all good things must come to an end. The lantern found a new "home" in the dining room and I brought in one of my favorite Target finds from last year to become the focus of this table "arrangement".. I played around with a few things but this is the one that I was happy about the most in the heat of the moment. Yes, the olive bucket came in from outside and I stuffed it full of greenery and faux lambs ear I picked up at Micheal's Stores. Since my table is so HUGE, a single table runner is never long enough. So I decided to do two runners instead, it just made more sense. I like the symmetry it adds. Don't you?! I seriously think that lambs ear and old buckets is the best combination ever! I think it works pretty much everywhere and with several different decorating styles, not just farmhouse! Plus it's SUPER easy! What do you guys think about this space? I hope you babes have a great week! Are you following TGF on Facebook? I'd love to have you! Stop over and say "Hey!" I'm ready to decorate for Easter too! Easter is so early this year. Table looks great! GIRL. The temptation is so real! HAHA! Thank you! I love this! 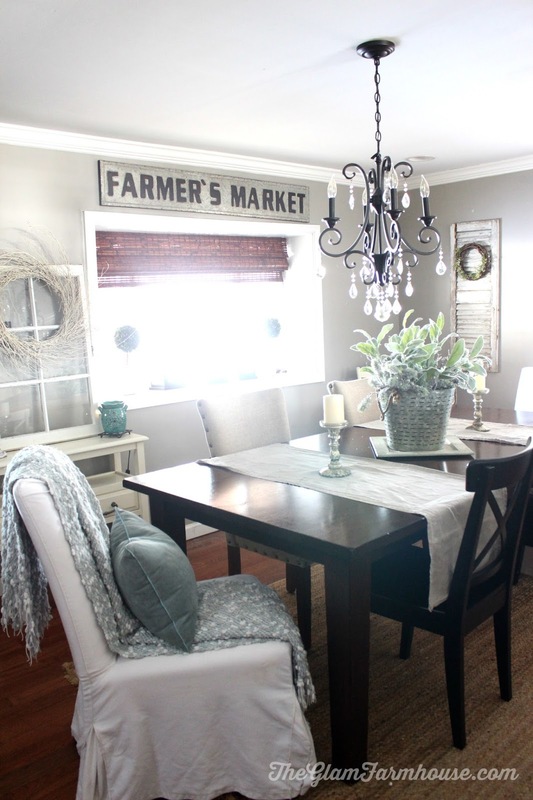 We have a giant table as well, so I love the idea of two table runners. And I'm glad that you kept the candle holders. They're really pretty! 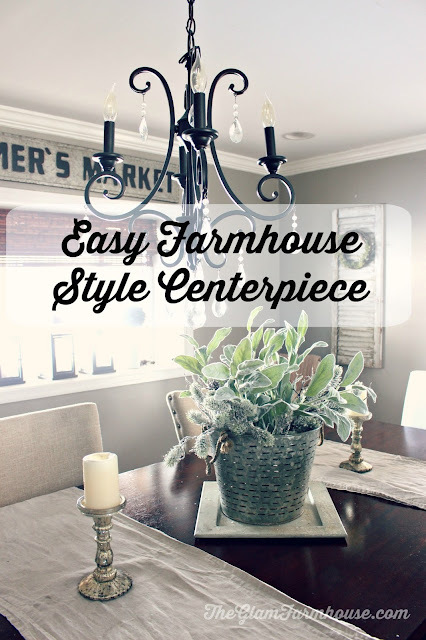 Lambs ear and galvanized buckets are my jam.